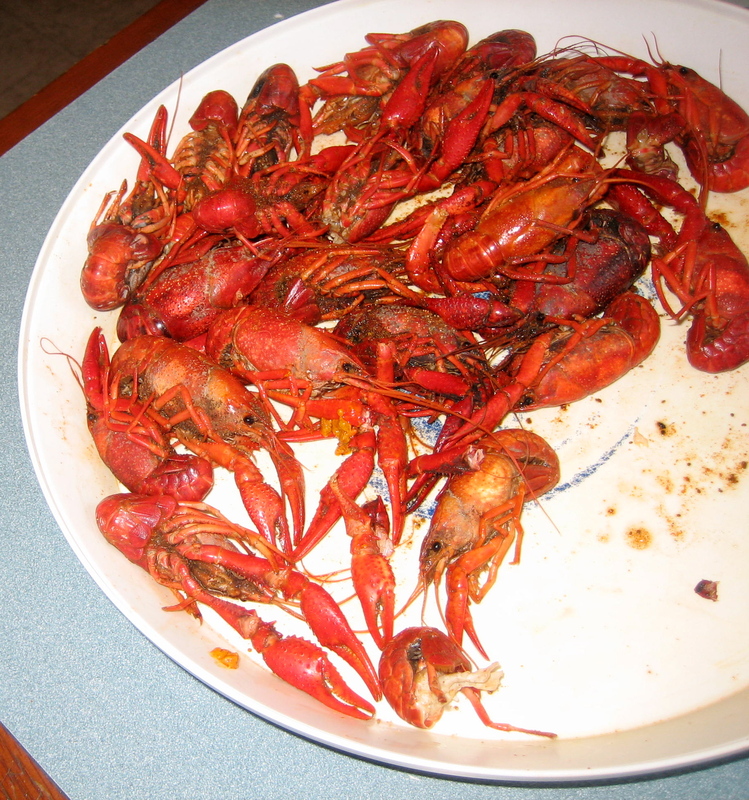 I ate, and actually liked, mudbugs at Bro’s Cajun Cuisine in Nashville (mudbugs, by the way, are crawfish). 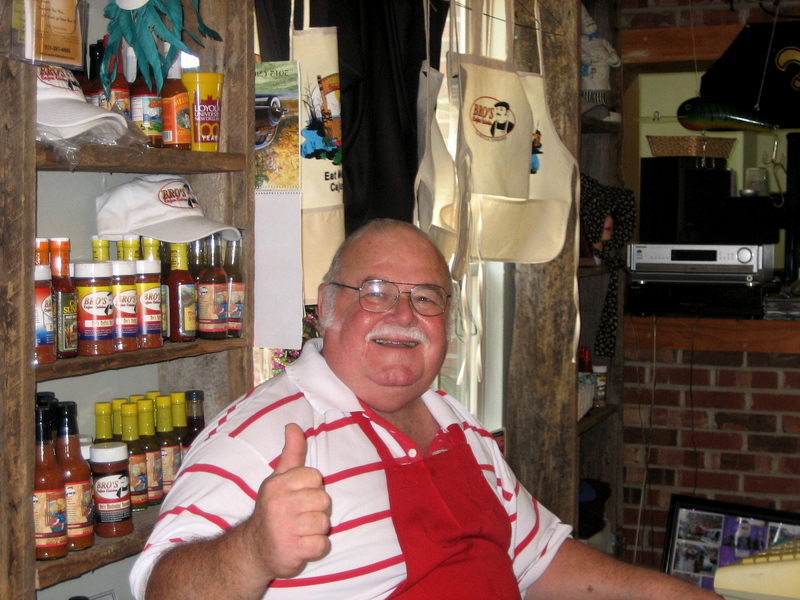 Bro’s food is authentic and tasty–gumbo, etoufee, jambalaya, red beans & rice, shrimp creole. Chef/Owner Darrell Breaux (featured on Guy Fierri’s Diner’s Drive-ins and Dives) also makes his own smoked sausage in his own smokehouse (out back behind the restaurant). In addition to leaving well-fed and happy, we enjoyed the feeling of having taken a quick, relaxing and inexpensive trip to the Louisiana Bayou, without leaving Nashville. 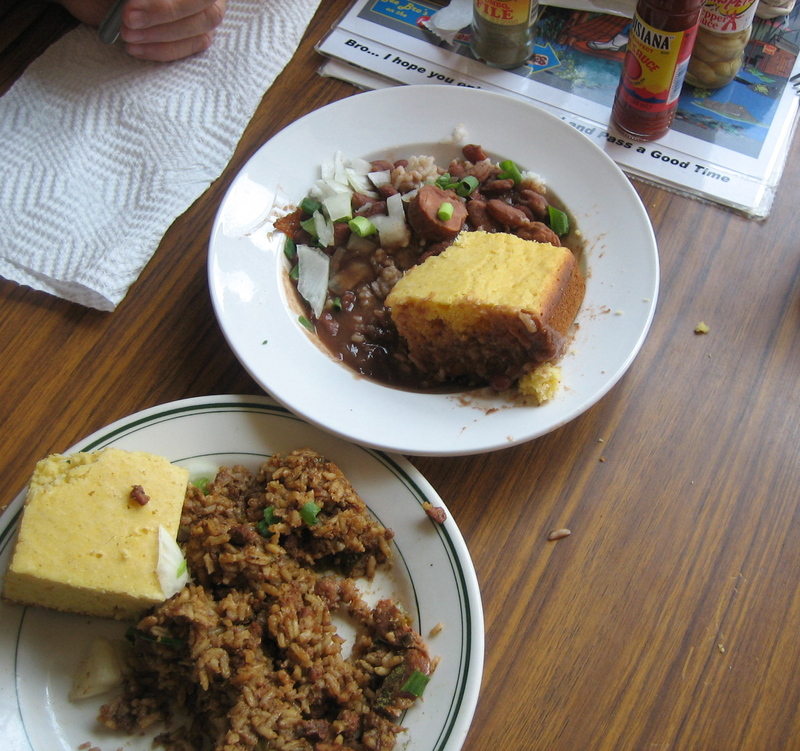 Red Beans & Rice, Cornbread, and Jambalaya. 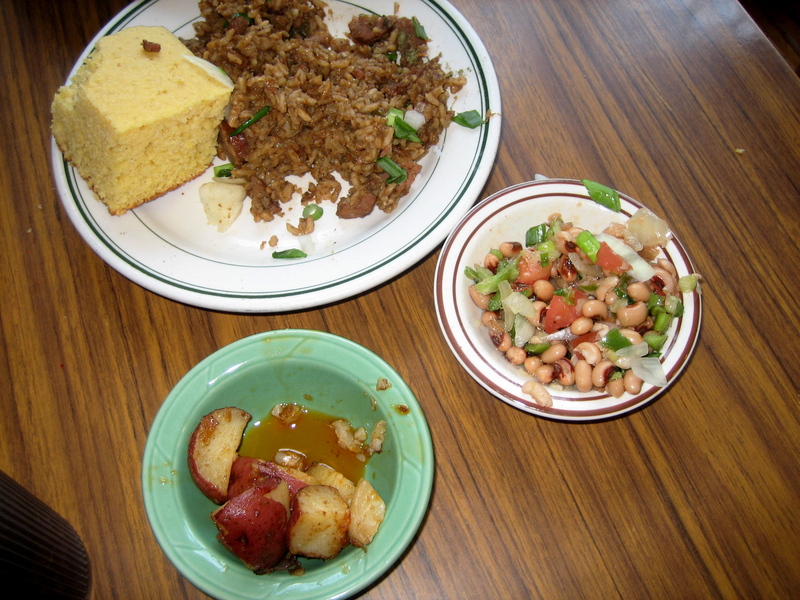 Oh, and the jambalaya entree came with cornbread + 2 sides–we chose red potatoes and black-eyed pea salad. After we ate all we could, I wrapped one slice of leftover cornbread in a napkin, brought it home in my purse, stored it in the refrigerator and the next morning I whipped up orange-cornbread pudding for breakfast. I was inspired by the notion that some of the best food in the world has been invented by rustic home cooks who had to”make do” with whatever was on hand. 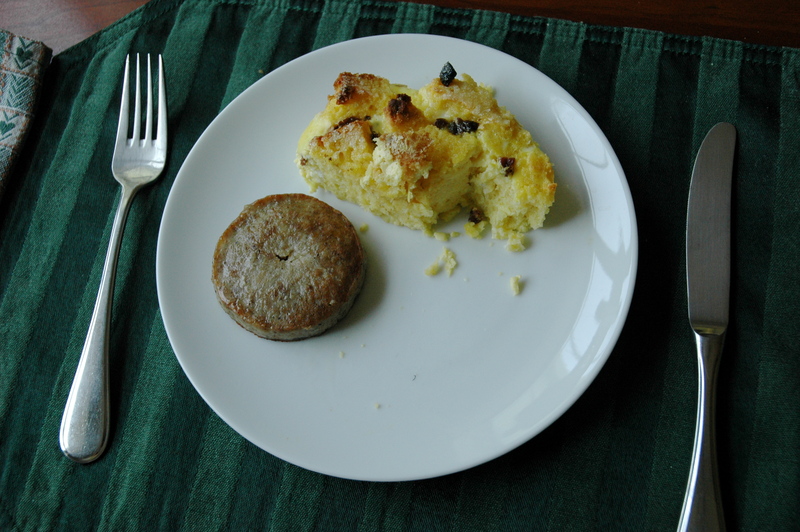 A sweet breakfast from leftover cornbread, with a sausage patty. 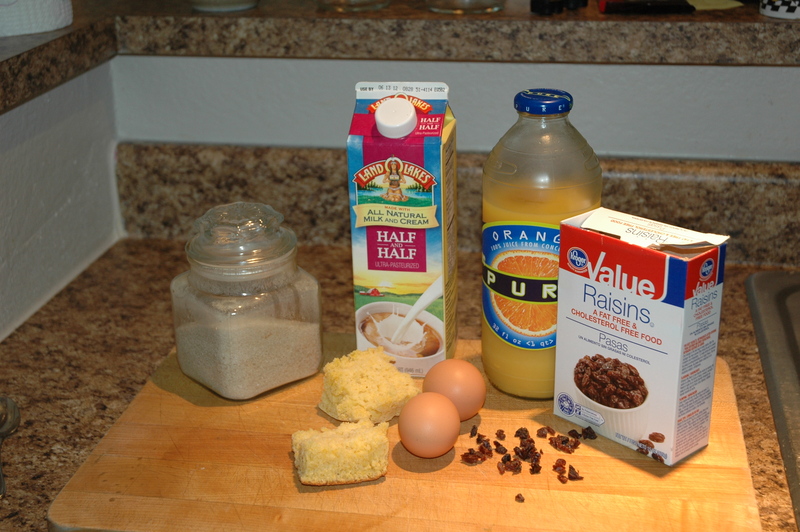 1 large piece leftover stale cornbread (cubed), 1/4 cup raisins, 2 eggs, 1/4 cup half & half or milk, 1/4 cup orange juice. 1 tablespoon raw sugar–serves 2. 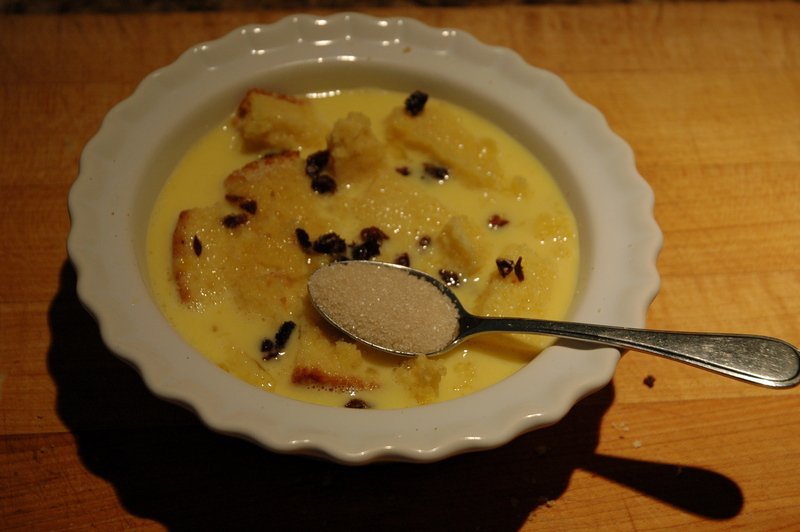 Place cubed cornbread and raisins in oven-proof baking dish. Beat eggs and mix with cream & orange juice, and pour over cornbread cubes. Sprinkle with raw sugar. Bake in water bath at 350F for approximately 30 minutes. This sweet breakfast goes to show that living richly does not require great wealth. An abundant life is given to those who live deeply and vividly, who seek a sense of purpose and well-being, make time for family, friends and fun, stockpile gratitude, happiness and peace. People who incorporate simplicity, frugality, minimalism and sustainability into their lives find wisdom and sensible goodness. What a testimony to the human spirit, that being forced to make the most of minimal ingredients, (food disdained by the wealthy, food foraged, stretched or “borrowed”) has led to culinary triumphs: grits and greens (soul food); bruschetta, bread salad and polenta (the peasant food of Tuscany); peirogi (an ingenious Polish invention that transforms left-over potatoes into pure comfort); orange-cornbread pudding, and, perhaps, best of all–jambalaya, gumbo and red beans and rice (Cajun classics). So embrace the Cajun spirit of “making-do, and Laissez les bons temps rouler– let the good times roll! 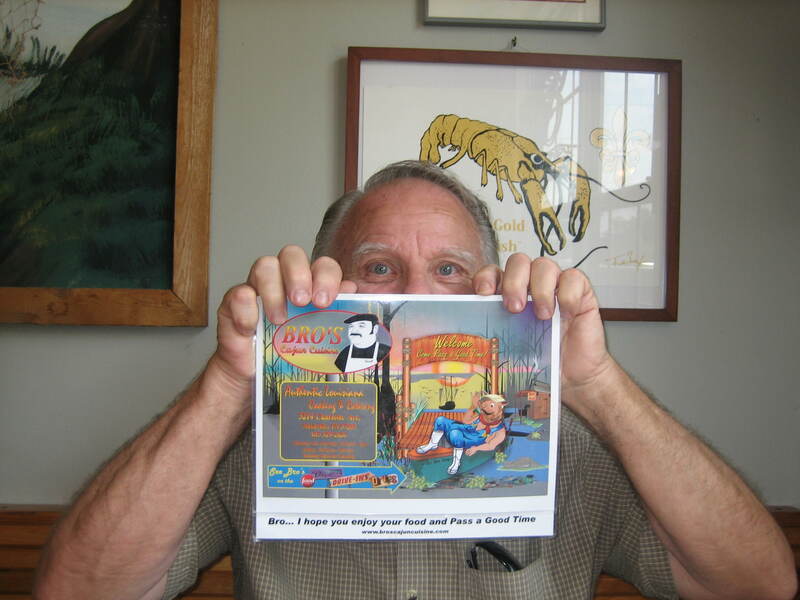 Kilroy was here–Bro’s Cajun Cafe in Nashville.